Washington gets a B- for women’s equity. What are the best, and worst, states to live in if you’re a woman? How long do women have to wait before we close the gender wage gap? And how do these numbers vary across age, race, immigration status and occupation in the United States? You can learn the answers to these questions, and a whole lot more, in The Status of Women in the States: 2015 the first in a series recently published by the Institute for Women’s Policy Research. The report authors offer an in-depth analysis of women’s employment and earnings, which includes state-by-state projections on when the gender wage gap will close. In nearly half of all states and the District of Columbia, women’s economic status has either worsened or remained unchanged in the last decade. If progress continues at the current rate, the gap between women’s and men’s wages in the United States will not close until 2058. For Washington women, that year is even later – we won’t reach gender pay equity until 2071! And for five sorry states, women won’t see gender pay equity until the next century. Sorry, Wyoming, but you placed dead last. A typical working woman loses $530,000 over her lifetime due to the wage gap. 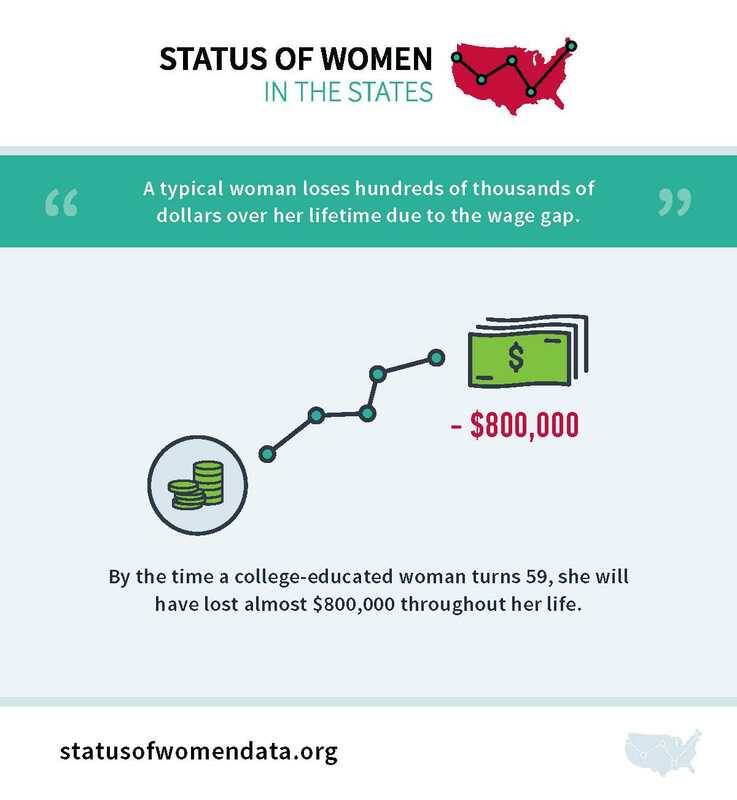 By the time a college-educated working woman turns 59, she will have lost almost $800,000. In fact, the gender wage gap is widest for women with higher levels of educational attainment. For example, a woman with a graduate degree earns less than a man with a bachelor’s degree! The report breaks down how these numbers vary for different groups of women. For example, women over 65 have a wider pay gap than millenials. Women over 65 make just 72.5 cents for every dollar a man (in their age group) makes, compared to 85.7 cents for millenial women (age 16–34.) 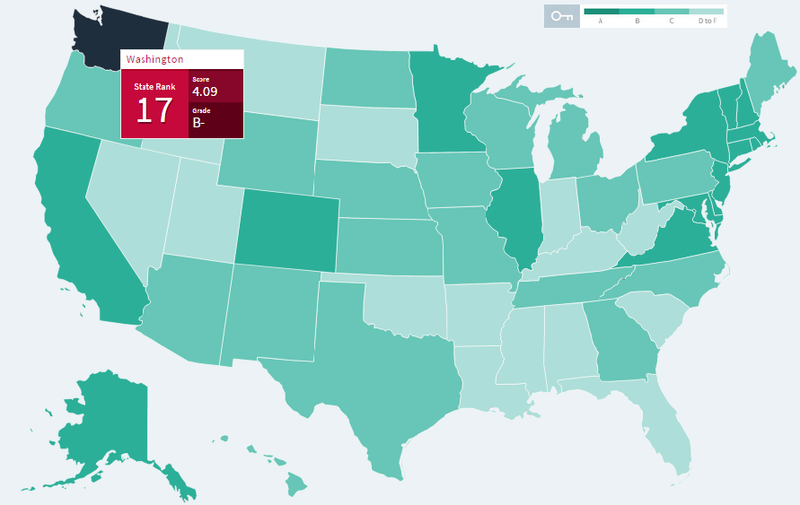 Notably, there is only one state in the US —New York—where young women out-earn young men, making $1.02 to men’s $1. The poverty rate for women in Washington is lower than the national average – though women of color and single moms still face disproportionate rates of poverty. Native American women in WA have the highest poverty rate at 27.1% and families headed by single women are also much more likely to be poor – 39.4% of families in this category live below the poverty line. Washington ranks fifth in the nation for number of state legislature seats held by women, who hold 32.7% of the 147 seats. Addressing disparities in employment and income for women – across all categories of age, race, occupation and immigration status – takes creative, effective and smart policy solutions. We need policies like paid sick days and paid family leave that recognize the “double and triple duty” that women perform at home as caregivers for kids and aging parents. We need a higher minimum wage, since women are much more likely to work low-wage jobs that offer little to no benefits. And we need stronger enforcement of existing legislation related to discrimination in the workplace and improved wage transparency like the kind called for in the Equal Pay Opportunity Act. EOI is working hard to advance these progressive policies and more to make sure women have a fair shot at building economic security for themselves and their families. You can find legislative updates about the policies above and more on the EOI blog, Washington Policy Review. Want to learn more about the IWPR results? In the coming months, IWPR will continue to release new sections of the Status of Women in the States: 2015 report with national and state-level data on Poverty & Opportunity, Violence & Safety, Health & Well-Being, Reproductive Rights, Political Participation, and Work & Family. You can read more on their website.